First to run Cataract Canyon: Fur trappers and prospectors in the late 1700's and early 1800's, followed by John Wesley Powell in 1869. Desolation and Gray Canyons lie between the towns of Duchesne and Green River in, east central Utah. These canyons are intertwined with history of the Fremont Indians, John Wesley Powell, ranchers and outlaws and are a registered National Historic site. In 1869, after traveling through "a region of wildest desolation", John Wesley Powell named Desolation Canyon. Gray Canyon also received its name from Major Powell after considering the names Lignite and Coal Canyons. For about 5 million years this region was covered by Lake Uinta. During this time this shallow lake (never more than 100' deep) would continually rise and then lower. This created lakebed formations where oil shale is found. The other predominant formation is the Wasatch. This formation is one of streambed deposits left while the lake was low. Fossils such as plants, insects, fish, reptiles and, turtles can be found in both of these formations and help tell the story of Lake Uinta. At Rock Creek Ranch the canyon is 5,000' deep (deeper than the Grand Canyon at Bright Angel Trail!). As the walls of Desolation give way to Gray Canyon, you begin to enter the Mesa Verde Group which consists of sandstones and shales, including the oil bearing Mancos shale. 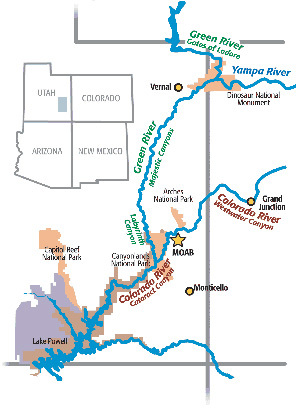 Throughout the 84 river miles of these two canyons are some of the most current and rapid forming debris flows in the Colorado River system. When Major Powell and his men first traveled through Desolation Canyon in 1869 this canyon was a very harsh environment. They had just lost one boat, their flour was soaked, their bacon was rancid and they had just finished a salad of fresh potato greens. Potato is a cousin of Nightshade, which is a hallucinogen. So you can imagine they were not at their best and their descriptions fit what they felt like. Many years before, these canyons were home to the Fremont Indians and one could expect a very different description. Containing many beautiful lush side streams and flood plains it was perfect for growing corn, beans and squash. These people left their history carved into the walls, capturing our curiosity of what made them disappear over 750 years ago. More recent Native American history in the area involves the Ute Indians. The current Ute Reservation was created in 1865. The reservation starts at Tabyago Canyon and goes all the way down to Coal Creek on the left hand side of the river. In the 1800's the first white men began to explore Desolation Canyon. These men were fur traders and mountain men. One of the most well known trappers was French-Canadian Dennis Julien. In the 1830's he left inscriptions up and down the Green and Colorado Rivers including one in Desolation Canyon. 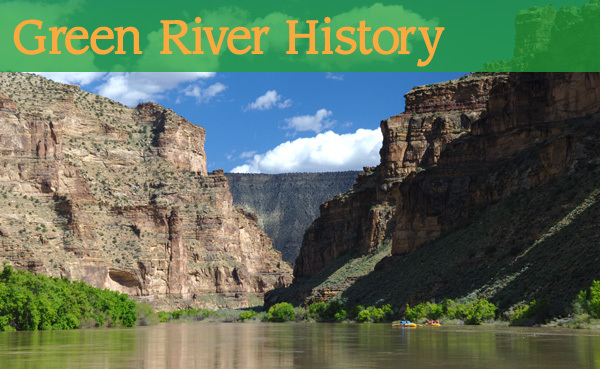 Captain John W. Gunnison forded the river near the current town of Green River, Utah in 1853 while working for the Pacific Railroad Survey. He and his crew were massacred soon afterwards. John Wesley Powell began his first expedition in Green River Wyoming in 1869. In the 1900's others, such as the Seamounton brothers, began to ranch the land. Other ranchers include the McPhersons, Hank Stewart of the Sand wash Ferry site, and the Wilcox's. 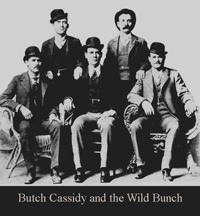 Outlaws also frequented the canyons and were friendly with the ranchers during this time. Outlaws such as Joe Walker and George Curry were killed in Desolation Canyon. The trail to access Desolation Canyon started from Woodside and followed the Price River into Gray Canyon. Desolation Canyon is very popular with families because of the varied history and fun rapids. There is something for everyone to do.